It is now possible to lock a set of filters which you have applied to your search results, in order to make them active for the remainder of your DiscoverEd session. 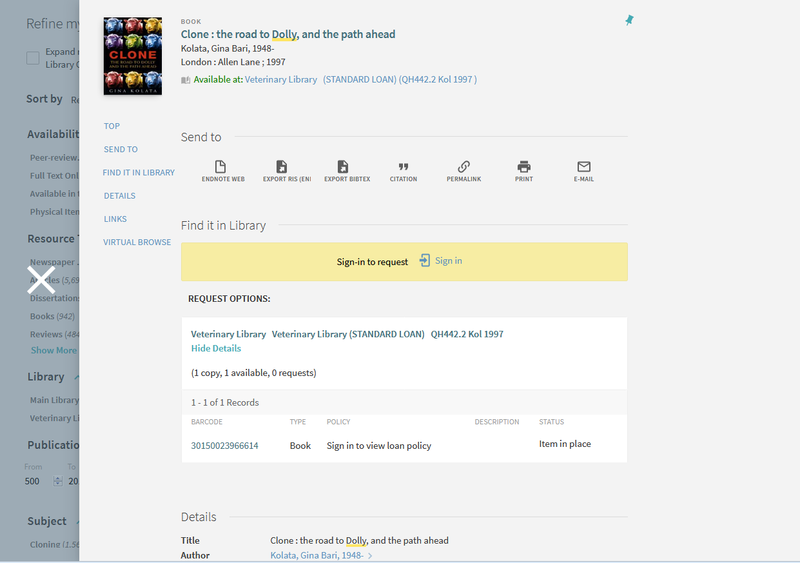 For example, you may wish to lock the Full Text Online Show Only filter and the Books Resource Type filter. This would result in subsequent searches being limited to electronic books. Run an initial search in DiscoverEd and apply the filter(s) you wish to use. In the Active filters section, click on the opened padlock icon next to the filter you wish to lock – the icon will change to a closed padlock icon. Repeat this process for each of the filters you want to lock for the rest of the session. These filters will remain locked for any subsequent searches that you carry out during the session. If you want to unlock the filters at any stage in your session, simply repeat the above process, this time changing the closed padlock icon back to the open padlock icon. 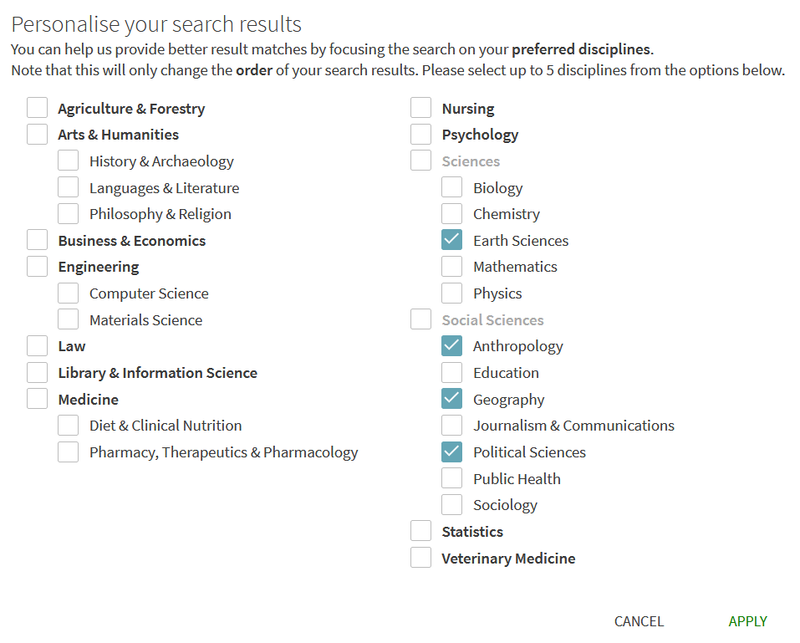 Please note that only the order of articles will change when you personalise your results, with the most relevant articles appearing nearer the top of your results list. The positioning of books from the University Library will not change in the list. 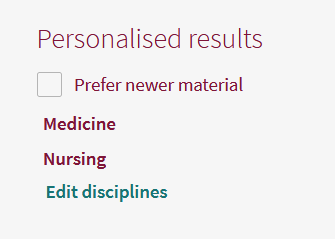 If you are signed in to DiscoverEd when you set your preferences then they will be retained and will be automatically applied to your search results in your next session, unless you change them or switch off the feature. 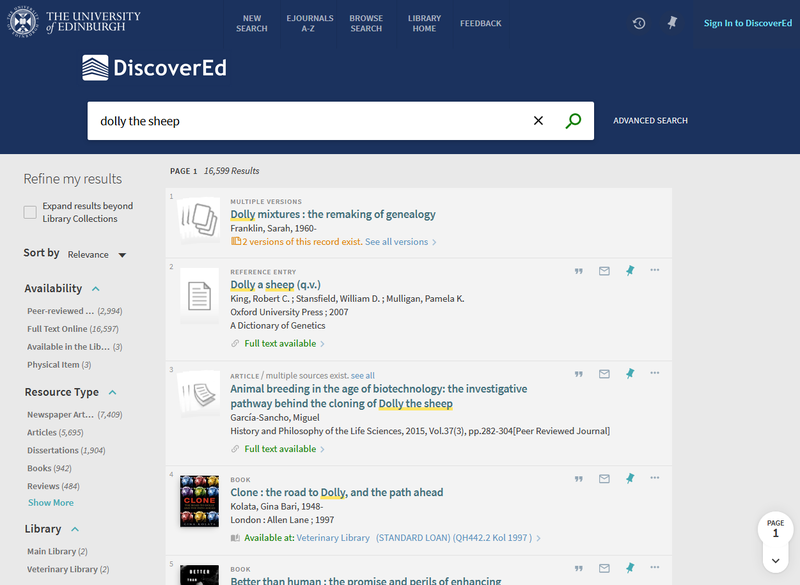 DiscoverEd allows you to view journal articles which have cited, or were cited in, other journal articles. This “citation trails” feature was previously only available when viewing the full details of an article, but it is now available directly from the results list. Click on the first icon (with the two upward arrows) to retrieve articles which have cited the article you are viewing. Click on the second icon (with the single downward arrow) to find articles that are cited in the article. It was previously only possible to renew borrowed items one at a time, or else to renew all the items you had on loan. It is now possible to select a group of items from your Loans list and renew only those selected items. A new “Special Collections” filter has been added to the Show Only filters section. 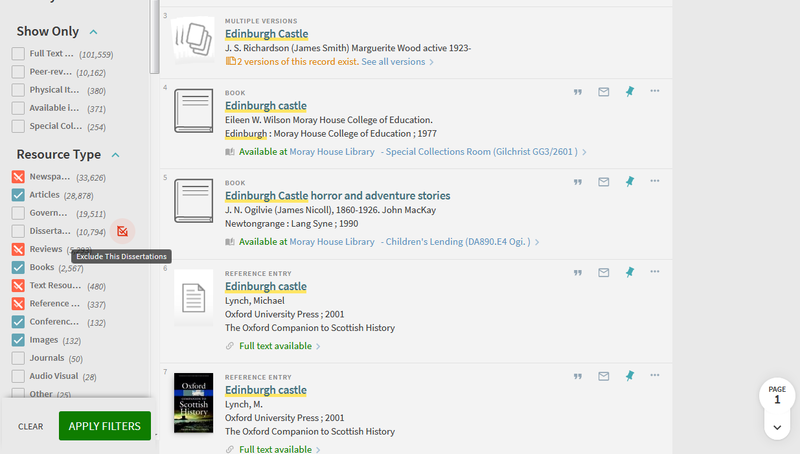 Selecting this filter allows you to limit the results of your search to material held at the Centre for Resource Collections (CRC) and other special collections in the Main Library, the Library Annexe (our off-campus storage facility), New College Library, Moray House Library and ECA Library. To include a filter, hover on the filter name and click on the tick box which appears to the left. To exclude a filter, hover over the filter name and click on the Exclude This.. icon which appears to the right. You can exclude or include as many filters as you wish. When you are finished making your selections, click on the APPLY FILTERS button to apply your selected filters to your search results. It is now possible to apply a set of filters to a search and make them “sticky” for the remainder of your DiscoverEd session. 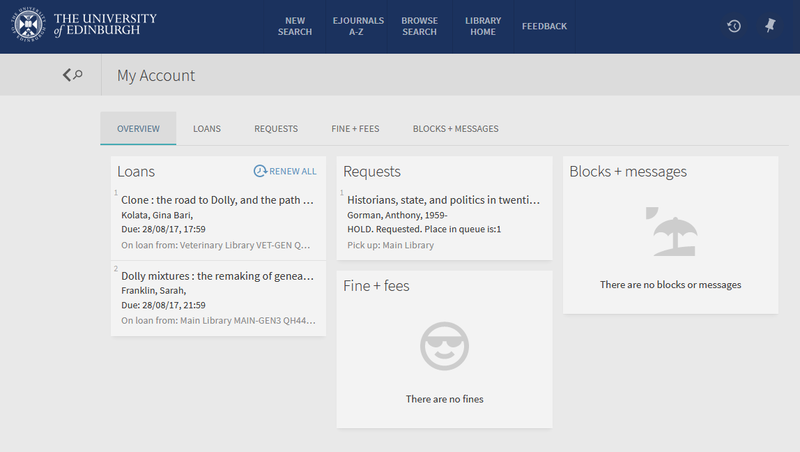 For example, you may wish to make the “Full Text Online” Show Only filter and the “Books” Resource Type filter sticky. This would result in subsequent searches being limited to electronic books. Run an initial search in DiscoverEd and apply the filter(s) you wish. In the “Active filters” section, hover over the name of a filter you wish to make sticky. A small opened padlock icon will appear. Click on this icon and it will change to a closed padlock icon. Repeat this process for each of the filters you want to make sticky. If you want to remove sticky filters at any stage in your session, simply repeat the above process, this time changing the closed padlock icon back to the open padlock icon. It is now possible to sort the items you have stored in My Favourites by Date Added, Title and Author. 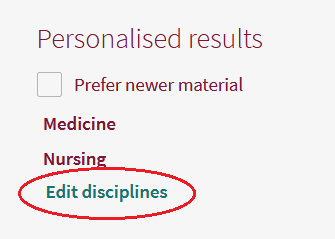 To use this functionality, simply go to your My Favourites and use the Sort by dropdown menu to apply the sort order you require. DiscoverEd now allows you to harvest the results of a saved search in your chosen RSS reader application. Make sure you are signed in to DiscoverEd. Run a search and click on Save this search to My Favourites. Go to My Favourites and select the SAVED SEARCHES tab. Click on the RSS icon on the right hand side of the display. Follow your usual procedure for setting up an RSS feed in your browser or dedicated RSS reader application. You can also create an RSS feed for any of the searches you have already saved in My Favourites by following steps 3-5 above. 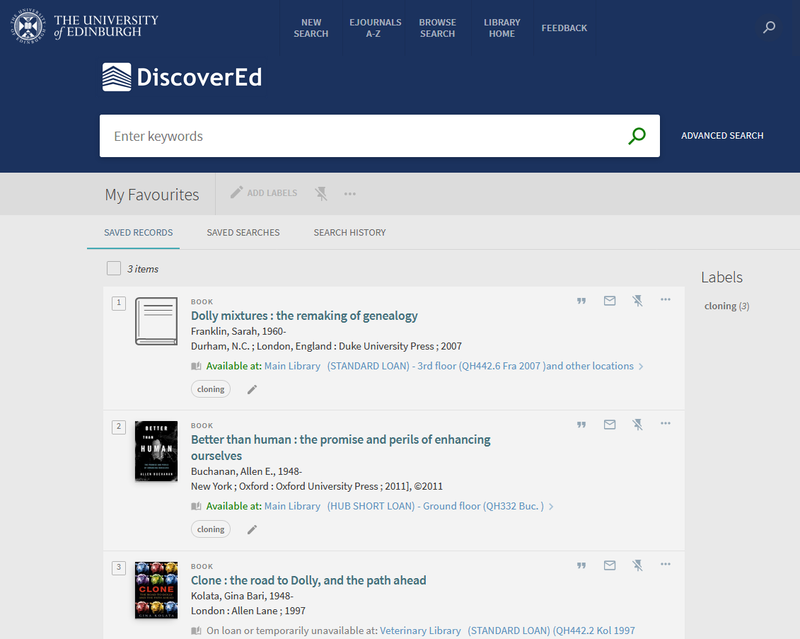 On Tuesday 4th July 2017 the Library rolled out a new look and feel for DiscoverEd, our online discovery service. This means there’s a new improved mobile responsive interface, so you can use DiscoverEd easily on a range of devices including tablets and phones. It is also now easier to navigate. The core functionality of DiscoverEd has not changed. Users are still be able to search the same extensive range of resources, view online resources, access their account details, renew loans, place requests, pay fines and access the same range of functions offered by the previous version of DiscoverEd. e-Shelf has been replaced with My Favourites. When you are signed in to DiscoverEd you can easily add items to your saved records list in My Favourites by clicking the Pin icon. The Queries section in the old DiscoverEd, which allowed you to save queries and set up alerts, has been replaced by the SAVED SEARCHES section in My Favourites. 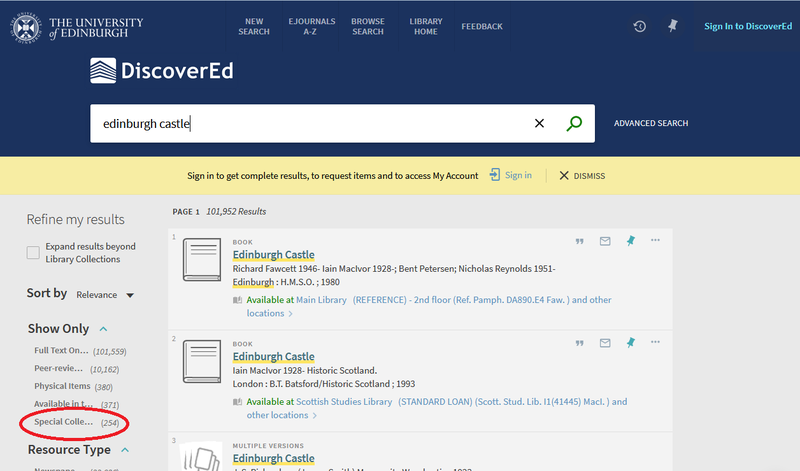 IMPORTANT: Please note that any saved queries you have in the old DiscoverEd ARE NOT be available in the new interface. Instead you will need to run these searches again in the new interface and then save each of them as a saved search in My Favourites.